Imagine this...you’re sipping some sweet tea on a hot Summer day in your favorite rocking chair on your VERY OWN deck! KM BUILDERS specializes in durable decks that our clients can enjoy for years to come! Decks are challenging to build correctly, so hiring an amateur contractor will most likely result in a botched project, which is something you want to avoid! Here’s some warnings about decks, from the experts at KM BUILDERS, the largest Design-Build remodeler in San Antonio. Decks have to be built strong! Period. People’s lives depend on it, so whoever is building your deck needs to know exactly how to construct it to meet the safety codes! If your deck is more than 30 in. off the ground, you MUST have a handrail to meet code! This will keep you and any small children safe when enjoying your deck. 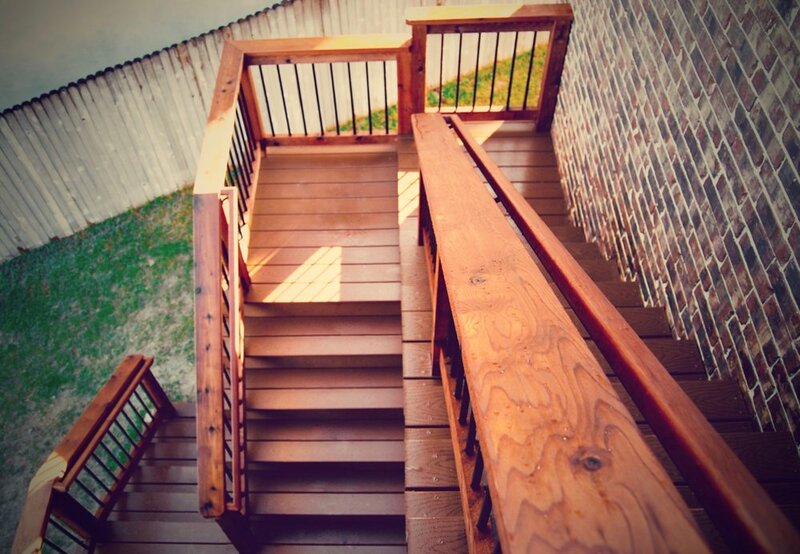 Wooden decks can impede water and block the path of drainage! So before you get a contractor to build a deck, be aware of the water path in your yard, to avoid any future drainage problems! Make sure your contractor is using the proper fasteners for your deck! Some fasteners aren't meant for longtime use and can be eaten away and decompose once they are out of date. Of course there are more to know about decks other than this list! However, if you have any questions just call us up at 210-680-KMCO and we’d be happy to help you!